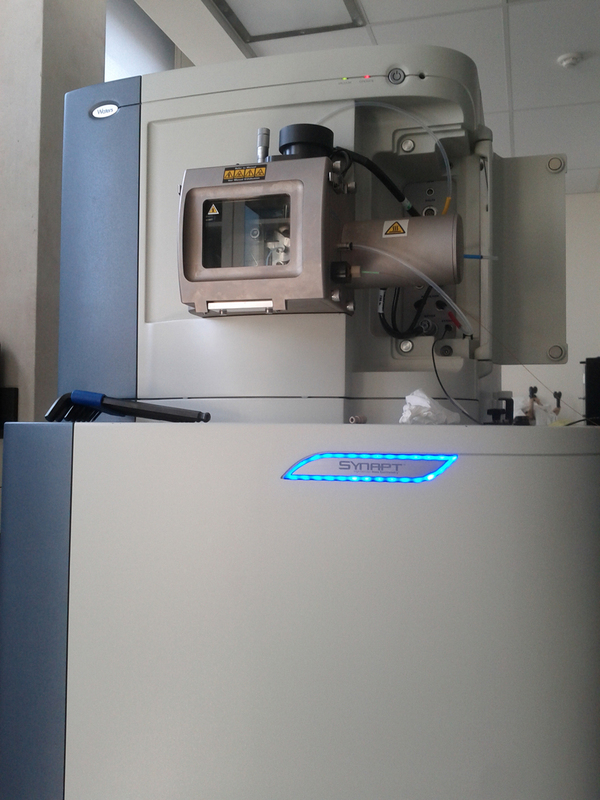 This instrument is a good TOF mass spectrometer in it's own right, but it's real advantage is versitility. The coolest feature of the synapt is Ion Mobility, which is a sort of chromatography in the gas phase. This allows us to separate ions not only by mass (like a normal mass spectrometer), but also by size. In our hands, ion mobility is a tool for studying protein folding and the topology of large protein complexes. 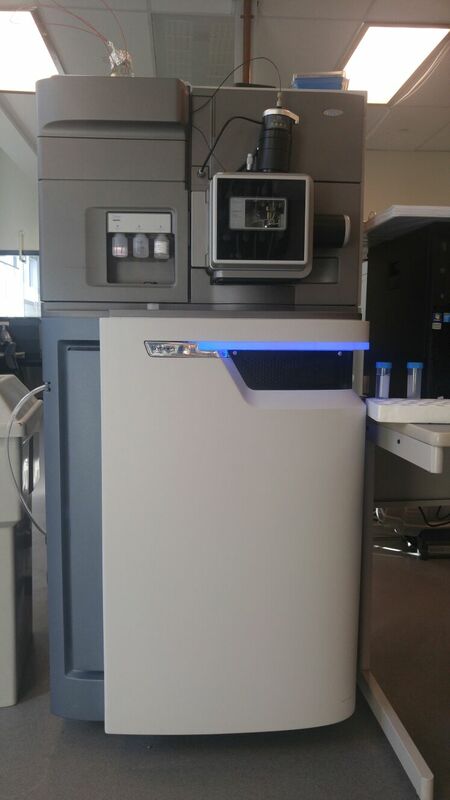 The synapt can do CAD fragmentation of proteins and peptides before mobility (so that you can separate the fragments by size) or after mobility, which allows for 'time aligned fragmentation' experiments where the fragments of ions are lined up according to the size of the precursor. Very cool! 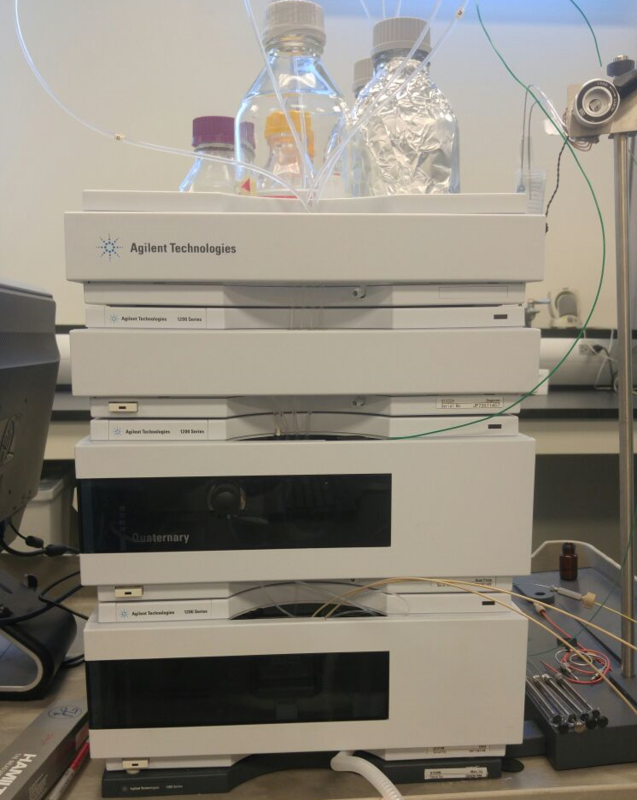 The Synapt can be coupled to the Agilent 1200 HPLC for LC-MS, and is primarily used in our lab to separate protein complexes and peptides using a variety of SEC and C18 columns. With real-time UV-detection coupled to the sensitivity of MS, small sample volumes can be analyzed with the determination of individual species in each eluted fraction. Our newest mass spectrometer features Stepwave technology and a high resolution QuanTof mass analyzer, providing the highest sensitivity, selectivity and speed for very challenging qualitative and quantitative applications. The high resolution exact mass MS/MS platform combines high efficiency ion mobility-based measurements and separations with high performance tandem mass spectrometry. The source is also equipped with a second sprayer, the Lockspray, which allows for an additional external calibration to be performed while spectra are recorded. Thus, extremely high levels of mass accuracy can be achieved (sub-ppm). This instrument has a nominal resolution (Resolution = mass/(width of peak at half maximum height)) of 10,000 but we regularly run it at 15,000+ and we've seen as high as 21,000! 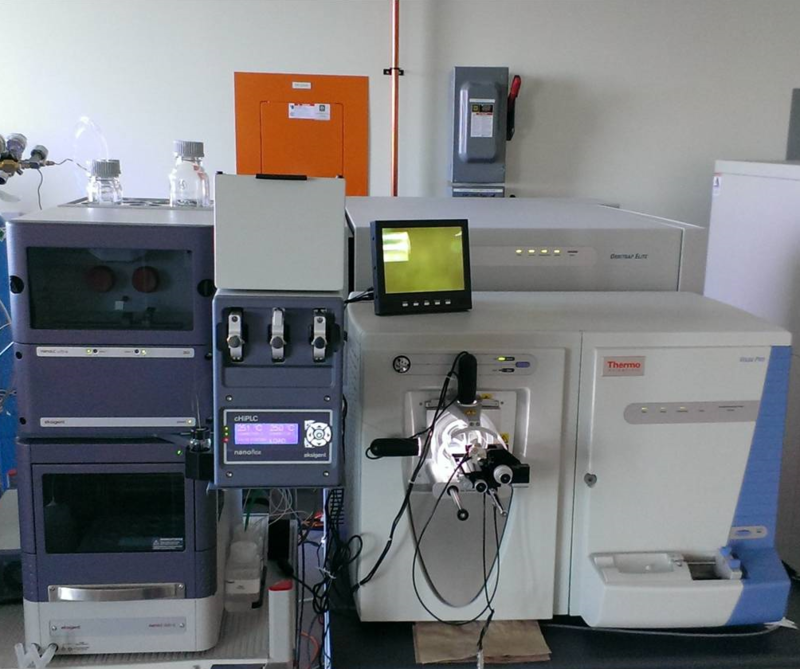 This allows us to see isotopic peaks on proteins up to 25,000 Da! Most important to us, however is the ability to measure masses of large proteins. Our current 'record' was with the saNOS protein, which has a mass of ~45,000 Da, to an accuracy of 2 Da! Not too shabby, but we should be able to go much higher! We have modified our instrument so that we can attach our own custom built microfludic devices. The Thermo Scientific Velos Pro ion trap contributes enhanced ion optics that increase sensitivity and reliability, a greater dynamic range for better precursor detection, and the power of MSn identification. The high-field Orbitrap mass analyzer geometry and advanced signal processing technologies enable resolution of >240,000, superior spectral quality, and higher scan speed. The outstanding resolution increases analytical certainty by improving molecular weight determination for intact proteins and clearly resolving smaller, isobaric species. It is especially useful when analyzing samples of high complexity and targeting analytes of low abundance in applications such as proteomics, metabolomics and lipidomics. The superior resolution and spectral quality, as well as the higher scan speed, increase proteome coverage in complex samples even with very low sample amounts. And the availability of multiple fragmentation techniques (CID, HCD and optional ETD) offers a new level of versatility for challenging research applications. We use this device as a very straightforward way of making Electrospray Mass Spectrometry Coupled Microfluidic Devices. It operates essentially like a laser printer. Draw it on the screen (with colour codes to control the laser power), press print and you're done! We can make chips of all shapes and sizes, from virtually any plastic with features down to 30 um.